You would have used a number of kodi movie addons. But there is something special about this streamhub kodi addon. With the name streamhub you can understand that it acts as a hub for watching all movies, tv shows and drama at one place. 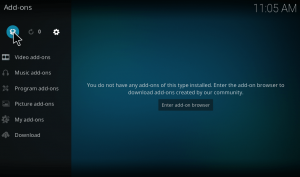 In order to install streamhub kodi addon one needs to install the streamhub repo. In streamhub kodi repo one can also find livehub kodi addon. So it’s like 2 movie addons from a single source. 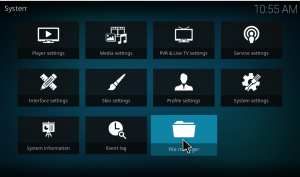 We will explain the installation of these two live hub kodi addons in this article. Your IP Address: 23.100.232.233 is visible to the public. You are taking risk! As a kodi user, we used to watch tv shows, movies, live streaming videos, PPV and much more. Watching these from your own IP address is totally risky. Also, few kodi add-ons are geo-restricted and can't be accessed by all the users. In order to get rid of such issues, a Kodi VPN is always recommended. Using a VPN will unlock geo-blocked content, keep you anonymous online and watch without buffering! After testing out various VPN services for kodi, we found IPVanish to be the best amongst all. Click here to get an instant 57% special discount on IPVanish for kodiforu users. 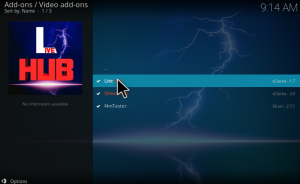 How to install streamhub kodi repo? 3. Tap on add source. 4. Now the dialog box will open up, just click none and give ok.
5. 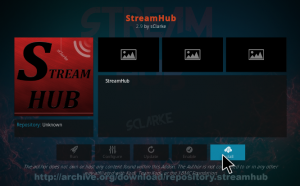 Then a screen will show up, where you need to enter the streamhub repo URL “https://archive.org/download/repository.streamhub” without any mistakes. Remember if you make any mistakes the path will not be added and will lead to error. 6. Now choose a desired name for the file. Here I choose it as ‘streamhub’. Then press ok. Remember that the name should not have been used before. 7. Next go back to the main menu by pressing back button. Then click on add-ons in the menu. 9. Then on the next screen press install from zip file to add the streamhub source. 10. Under the zip from file box you can find various files, just hang on to streamhub (whatever name you save the repository file, as said in step 6). 11.Under that choose repository.streamhub.zip. Then click ok.
12. Now a pop-up box will appear in the top right corner, once the zip file is installed.That’s about the installation of Streamhub kodi repo. 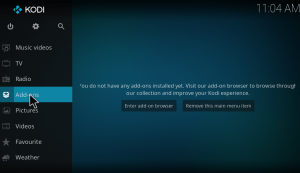 Let’s now explore some of the cool features of this awesome kodi addon. 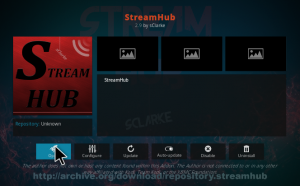 How to install streamhub & livehub kodi addons? 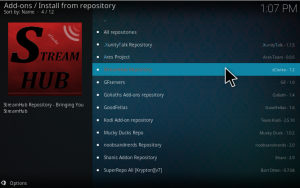 Streamhub kodi repository contains numerous addons. 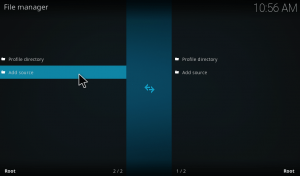 Moving to the process, how to use streamhub kodi repo for your favorite addons. It follows the simple procedure as described below. Open streamhub kodi repo by clicking on install from repository. 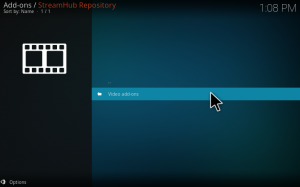 Here you have to select Streamhub Repository. Once you open streamhub repository, you can find video addons. Within video addons you can find several addons related to watching videos. Let us understand this better with a practical example. Say for example, if I want to watch tv shows, then I can go for Stream Hub. It is one of the popular addons for watching live shows and tv channels. When you want to access Stream hub, just click on it. On the next screen you will find an installation button, just tap on it. As simple as that. 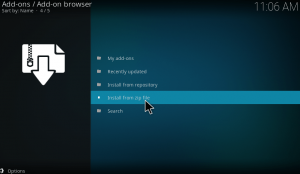 Once it is downloaded, a pop-up will appear acknowledging the installation of the add-on. Then open the add-on and start watching. 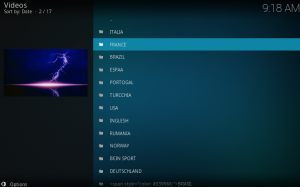 Once you open streamhub kodi addon, you can see various categories like movies, Tv shows, Live tv, Kids corner, Music, Documataries, Anime and so on. For example, let me get into Tv shows. Under Tv shows, you can find the most popular Tv show being aired like Game of Thrones, The big bang theory, American Gods, The Simpsons, House of cards, Dark matter and so on. 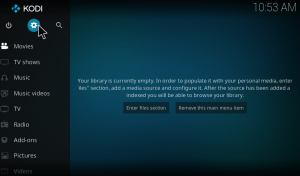 Let us check another addon from this repository, that is Livehub kodi addon. Livehub kodi addon is used for watching the live streaming of Tv channels. Let me show you how to watch your favorite channels with this addon. Follow the same installation procedure as Stream hub for installing live hub. Then open live hub. When you open Live hub, you can find 4 options as shown in the image below. 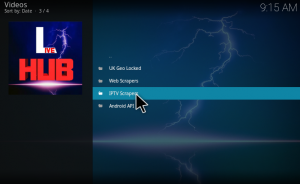 Choose IPTV scrapers by clicking on it. On the next screen, you can see the list of available regions that the addon supports for IPTV. Let me get into France. Under France region, you can see the list of available IPTV channels. You can surf through it and choose one. As soon as you click on any channel, you can see the live streaming of that channel in your system. The quality of display for live streaming is so good and the processing time is even less so you will not find any lag or any interruption. If you want to get back just click on ESC. That’s about the installation of streamhub kodi repo and livehub kodi addon. If you face any trouble with the installation part, do let us know via comment. Question: When I selected >StreamHub Repository, >Video Add-ons: the only options listed were StreamHub and Flixanity (not sure what this is, but added it). LiveHub add-on and f4mTester were not there for me to select. I selected the 2 that were there to install. It seem to have installed the add-on f4mTester, however I am unable to find LiveHub add-on anywhere, which is what I want. Can you tell me how I can find it to install? What do I need to do? Any help would be appreciated. Could you please tell me what. Have done wrong. I got stuck after added the file source and name it. I had a look at install from zip file and the name is not there. I have repeated the process twice same thing is happening.